Stretch marks often appear on the leg and abdominal skin, but in some cases, it can also be present on the breasts. These stretch marks on the breasts are present when the skin tears up because of the rapid increase or reduction in the breasts’ size. However, you do not need to feel worried too much if you see stretch marks on the breasts because it will cause no serious harm to your overall health. It just looks ugly and you may want to deal with these stretch marks as soon as possible. To eliminate stretch marks on breasts, there are a variety of natural ways. 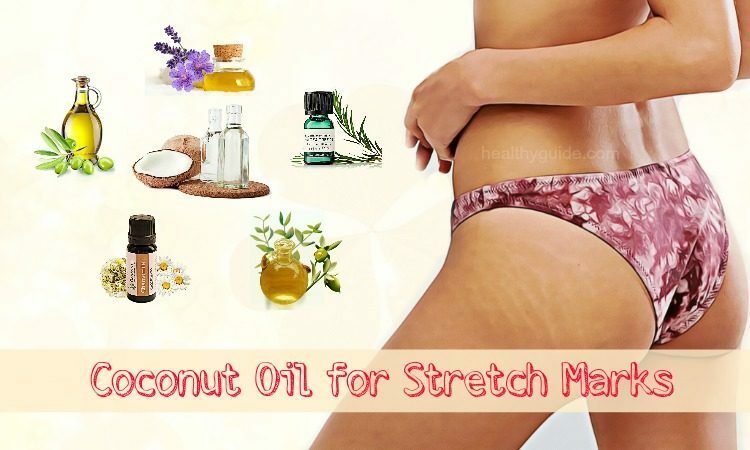 And, in this article, Healthy Guide will show you some of the simple yet effective ways to use coconut oil for stretch marks. However, at first, you should have a general understanding about this skin problem, including what stretch marks are, what causes them as well as the effects of coconut oil on these ugly stretch marks. I. What Are Stretch Marks? Stretch marks are a common skin problem, which almost all the women face at some point in their lives. And, how to deal with stretch marks on the breast is a concern for every woman. Rapid weight loss and weight gain: A sudden weight change always causes this skin condition. It makes your skin stretch and then falls back quickly, so not allowing your skin to recover. Breast augmentation: Stretch marks occur on breasts after you go for operational procedures such as breast implantation or breast augmentation. Hormonal changes: During puberty, menopause or pregnancy, the breasts will go through some developmental phases. Hereditary reason: According to a study , stretch marks on breasts have been found to be hereditary. If your mom has stretch marks on her breasts, then you can have higher risks of getting stretch marks on your breasts. Dehydration: Your body should stay hydrated to prevent the appearance of stretch marks on breasts as well as other body’s parts. Health disorders: Some health problems related to the adrenaline gland may be another cause of stretch marks on the body. It is not serious unless you have other symptoms such as bone loss, high blood pressure and diabetes. Read on How To Maintain A Healthy Weight Without Harsh Dieting to discover some of the best tips that can help you maintain a healthy weight while you do not need to follow a harsh diet. It contains vitamin E as well as other moisturizing agents that relieve the skin and keep it soft and healthy. It absorbs deep into the dermis layer and can heal both epidermis and dermis layer to fade these stretch marks. It contains saturated fats that aid to improve the cell walls. It moisturizes the skin, hence making it softer, suppler and more elastic. It contains antifungal, antibacterial, antimicrobial and anti-inflammatory agents, which help prevent the scars from getting infected or swelling. 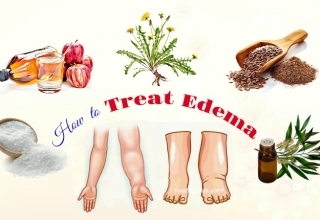 It contains vitamin E, vitamin K and iron as well as fatty acids to heal the skin from scarring or stretch marks and stimulate the skin cell regeneration. It contains skin-lightening properties that help lighten your skin and eliminate skin discoloration. It stimulates the collagen production, balances out the natural oils of the skin, and removes the dead skin cells, hence preventing these scars from appearing on the skin. It works as a great preventive home remedy for stretch marks because it can moisturize, heal andlubricate the skin in order to reduce the damage because of stretching of skin. List of 44 Ways To Lighten Your Skin Naturally In 2 Weeks That Work For People At All Ages will show you some of the most effective tips that can help you lighten your skin naturally in 2 weeks, so check it out! The effectiveness of coconut oil dependson the intensity and the age of stretch marks. Using coconut oil for stretch marks does not cause any unwanted side effects. The best time to use coconut oil for stretch marks is after taking a bath or shower when your skin is dry and clean. Always use cold compressed coconut oil. If you are allergic to coconuts, avoid using any of thehome remedies with coconut oil. You can reduce the appearance of stretch marks on your breast by using coconut oil. It is always best to get rid of stretch marks at the first stage. Coconut oil helps fade out the stretch marks and also makes these skin areas more radiant and smooth. It helps repair your damaged skin thanks to its high contents of essential nutrients. The vitamin E, vitamin K and iron found in coconut oil can helpstimulate new skin cell generation, which helps remove these ugly stretch marks. Addition to this, coconut oil also contains fatty acids that help keep your skin moisturized. Plus, the lauric acid found in coconut oil also contains antibacterial and antimicrobial properties, so it can boost up the healing process. Simply, apply some coconut oil layer after layer on your stretch marks. Gently massage the oil on your affected skin area. Repeat this home remedy 2-3 times per day until you notice these stretch marks fade away. Note: For better results,you should use warm virgin coconut oil at night before going to bed. Massage it and leave it on overnight. The next morning, rinse it off with lukewarm water. You can make this amazing recipe at home if you want to get rid of stretch marksduring pregnancyby using natural ingredients. Lavender oil contains antibacterial, antifungal, anti-inflammatory and antimicrobial properties; therefore, its application can help treat stretch marks effectively. Meanwhile, chamomile oil contains antibiotic, antiseptic, and antidepressant properties, which support the recovery process. Besides, these oils can help you retain the skin texture and add shine to the skin. Firstly, mix all of these oils in a small bowl. Repeat this process daily to help fade away these stretch marks. If you are unsure about how to use coconut oil for stretch marks during pregnancy, then you can try this recipe. This oil mixture will help you moisturize your skin while fading out your stretch marks. Firstly, mix coconut oil and olive oil in a mixing bowl. Add vitamin E oil as well as the content from vitamin A capsules to the mixture. Mix all of these ingredients well before using it to massage your affected skin areas. Avocado oil contains many essential vitamins such as vitamin A, vitamin D, vitamin E as well as unsaturated fatty acids, all of which are required for skin healing. Firstly, warm up 2 cups of organic coconut oil in a container. Whip ½ cup of avocado oil to the coconut oil, and then add the cornmeal. After that, massage this oil mixture on your stretch marks for about 15 minutes. Repeat this home remedy once per day. Castor oil works as humectants and it can be used toretain moisture in your skin. The combination of coconut oil and castor oil is very effective in fading the stretch marks and moisturizing the skin, hence making your skin soft and supple. Mix 1 tsp. of organic virgin coconut oil with 2 tsp. of castor oil. Repeat this process 2- 3 times per day until your stretch marks go away. 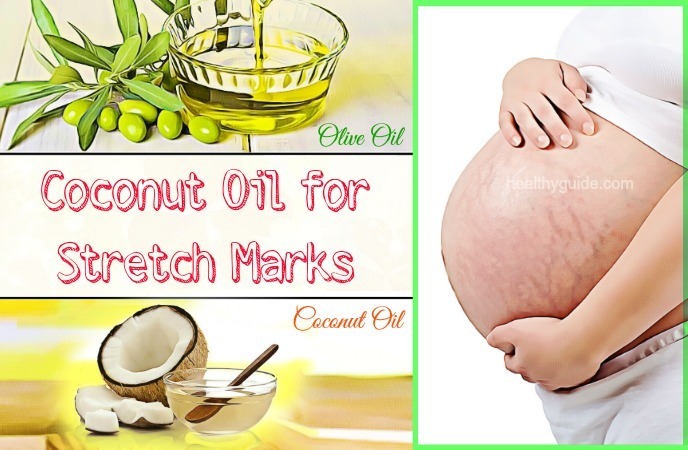 If you are looking for 100% certain way to use coconut oil for stretch marks during pregnancy, then you do not skip this oil mixture. Blend all of these oils in a mixing bowl. Then, massage this mixture on your stretch marks. If you want to know how to use coconut oil for stretch marks on breasts, you should not skip this home remedy. Actually, it is very easy to make at home and it is also very effective in eliminating stretch marks on breasts. Firstly, mix few drops each of olive oil and coconut oil. Then, massage your stretch marks with this oil mixture in a gentle way. Leave it on until it penetratesinto the skin completely. Note: For extra benefits, you can add the content of vitamin A capsules to this oil mixture. Lemon juice is known as a good source of vitamin C that works as a bleaching property and helps fade out the stretch marks quickly. Firstly, mix lemon juice with coconut oil in a bowl. Mix them well until you create a semi-clear liquid. Then, apply this liquid on your stretch marks. Use a plastic wrap to cover the area and then place a hot towel over it for about half an hour. Remove the plastic wrap and the excess oil from your affected areas. Firstly, use your hands to crush dried arnica Montana flowers. Place 2 cups of organic coconut oil in a double boiler and then add the crushed arnica flowers. Leave it to steep for about 1-2 days. Next, remove it from the heat and let it cool down naturally. Strain the oil with the help of a cheese cloth and place the oil in a glass jar. Then, place that oil again in the double boiler and turn the heat low. Add ½ cup of beeswax to the double boiler and let it melt completely. Turn off the heat and let it cool down for half an hour. After that, add ¼ tbsp. each of peppermint and lavender oil and mix them well. Transfer this oil mixture to a glass jar. 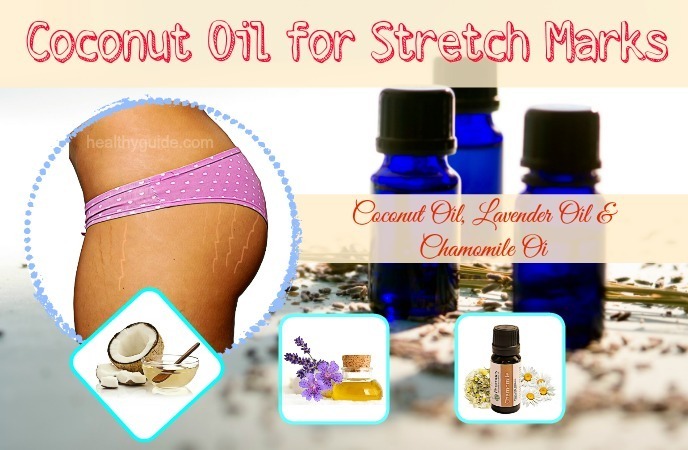 Finally, massage your stretch marks with this oil mixture 1-3 times per day. According to a study about turmeric benefits for skin and hair care , turmeric has been used in many beauty treatments thanks to its multiple benefits for skincare. Turmeric contains antioxidant, anti-inflammatory and antiseptic properties, which make it a great home remedy for treating many skin problems such asacne, stretch marks, etc. Firstly, soak the turmeric overnight and the next morning, create a paste of the turmeric by using a mixer. Take a cup of coconut oil in a container and warm it up in flow heat. Then, add the turmeric paste to the container. Remove it from the heat after 5 minutes and let it cool down naturally. When it becomes cool, place it in a glass jar. Finally, wash it off with normal water. Sugar containsfatty acids, which help moisturize skin and simultaneously prevent stretch marks. Besides, sugar also helps remove dead skin cells to fade stretch marks and increase blood circulation to your stretch marks. Firstly, melt 2 tbsp. of coconut oil and then add 2 tbsp. of sugar to it. Mix them well before adding vanilla oil to it. Mix all of the ingredients well. Gently massage the oil mixture on your stretch marks for about 15 minutes. Repeat this process twice a day for the best results. 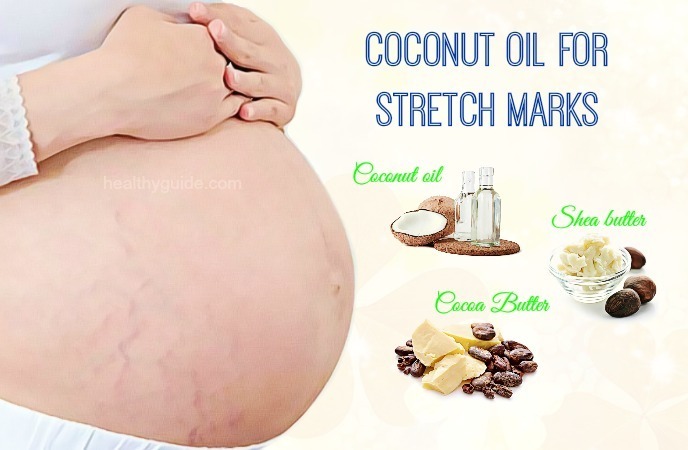 There are some other effective ways to use coconut oil for stretch marks during pregnancy in this article. So, you should keep reading this article and then try to apply any of these home remedies for good. In this recipe, apart from the benefits of coconut oil, tea tree oil is also loaded with anti-inflammatory, anti-viral, and antibiotic agents. According to a study about natural treatments for stretch marks , all of these properties can help to deal with many skin issues, including stretch marks. Firstly, mix 4 tbsp. of coconut oil with 3-4 drops of tea tree oil. Then, apply this oil mixture on your affected skin areas. Repeat this home remedy 2-3 times daily for fading stretch marks effectively. Firstly, place the dried ginger root, calendula flowers and apricot kernel oil in a bowl. Then, place this mixture in a double boiler and simmer it for half an hour. Use a cheesecloth to strain the mixture and gain about 2 tbsp. of infused oil. Add shea butter and coconut oil to it and heat it until the butter melts completely. Mix all of these ingredients well, turn off the heat before pouring it into a glass jar. Use this mixed oil at least twice a day to fade your stretch marks gradually. Firstly, take the natural soap and then grate it with the help of a cheese grater. Sprinkle 2 ounces of coconut oil on it and then heat it using a double boiler. Remember to stir it occasionally. When liquefied, remove it from the heat. Then, add 10-15 dried rose petals and 3 drops of rose geranium oil to the mixture. Mix them well before pouring it to the soap molds. After that, let the soap cool before removing them from the soap mold. Allow them to dry out for 3- 4 days. Use this coconut soap while taking a bath. Another natural way to use coconut oil for stretch marks during pregnancy is combining coconut oil with rose essential oil. The combination of coconut oil and rose essential oil is also known as a great home remedy for stretch marks removal. Then, add 10 drops of rose essential oil to the coconut oil. Mix them well and leave it on for about 40 minutes before pouring it into a glass jar. After that, apply this oil mixture on your stretch marks and gently massage for half an hour. When it comes to learning how to use coconut oil for stretch marks on breasts, the combination of coconut oil and beeswax is a really amazing treatment for stretch mark removal. In a double boiler, take shea butter and mango and melt them on low heat. Add a cup of beeswax to the mixture. Stir it occasionally until all of these ingredients melt down. Then, add grapeseed oil and organic virgin coconut oil to the mixture. Mix them well for a minute before removing it from the heat. Transfer it to a container and add 2 drops each of vitamin E oil and the infused essential oil to it. After that, mix all of these ingredients well before pouring it into molds. Let it cool down for about 30 minutes and then take the bars out of the molds. Another natural way to use coconut oil for stretch marks during pregnancy is using coconut oil body butter, which is highly recommended for stretch mark removal. Firstly, mix shea butter, jojoba oil and coconut oil in a glass bowl. Then, place this in the fridge for 60 minutesuntil it solidifies. Remove it from the heat and mix the oils using a hand mixer until you get a whipped cream. Next, pour it into a glass jar before refrigerating it for 1 hour. Finally, apply this body butter at least once per day to reduce your stretch marks. Firstly, warm up coconut oil in a container and then mix cane sugar with it. Let the mixture cool down before applying it on your stretch marks. Gently massage it about 20-25 minutes. Repeat this process once per day for the best results. When it comes to learning how to use coconut oil for stretch marks on breasts, you should try this coconut oil skin polish recipe. In a pan, warm up coconut oil on medium heat. Then, take cornmeal and almond oil in another vessel. Blend them well using a hand mixer. Add lavender oil and warm coconut oil to the mixture. Mix them well and leave it on for an hour. Leave it for 20- 30 minutes before washing it off with normal water. Repeat this home remedy at least once per day to get rid of the stretch marks effectively. 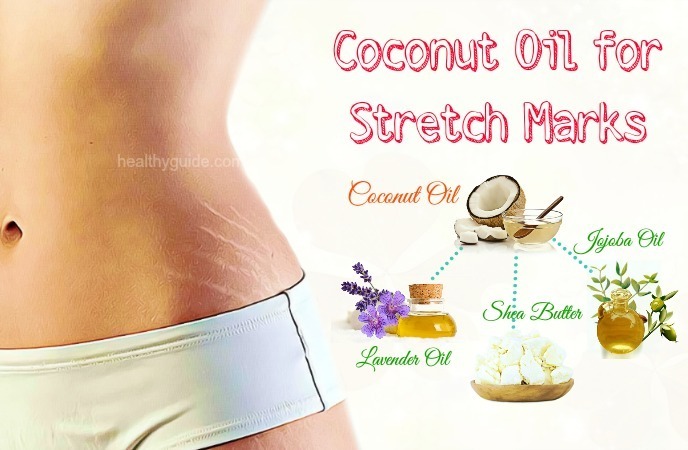 This is another great way to use coconut oil for stretch marks on breasts that you should not look down, yet consider applying at home for good. Mix all of the ingredients in a mixing bowl for about 5-7 minutes using a hand mixer until you get a whipped mixture. Then, pour this whipped mixture into a container with a lid. Finally, apply this cream 2-3 times daily. According to a research about how to lighten stretch marks with lemon  , lemon juice can help you get rid of stretch marks effectively thanks to its acidic nature. Besides, it also helps reduce acne scars and skin injuries. Meanwhile, vitamin E oil can help prevent the appearance of stretch marks and enhance the skin elasticity. Firstly, placewhite sugar in a glass bottle and add coconut oil and lemon juice to it. Take the vitamin E oil from the capsule and place it into the glass bottle. Mix all of these ingredients before placing it in the fridge. After that, apply this oil mixture on your stretch marks and gently massage it. Repeat this remedy daily before you go to bath to fade out stretch marks effectively. In regard to learning how to use coconut oil for stretch marks on breasts, you can try combining coconut oil with cocoa butter and shea butter. Mix the coconut oil, shea butter and cocoa butter and then melt in in a double boiler. Then, add few drops of vitamin E oil to the mixture. Let it cool down before applying it onto your stretch marks. Gently massage it and leave it on until the oils penetrate into your skin completely. One of the best ways on how to use coconut oil for stretch marks on breasts that has been used by women is coconut oil mixed with coffee grinds. Firstly, combine coconut oil and coffee grounds. Pour this mixture into molds and leave it on for about 5 hours. Remove them from molds before placing them in the airtight container. Then, place it in the fridge. Before you go to bath, take one cube and then scrub it on your stretch marks. Leave it on for 5 minutes before washing and bathing as normal. Alternatively, scrub the mixture of coconut oil and coffee grounds immediately for several minutes and then rinse it off. Repeat this home remedy 3 times per week. 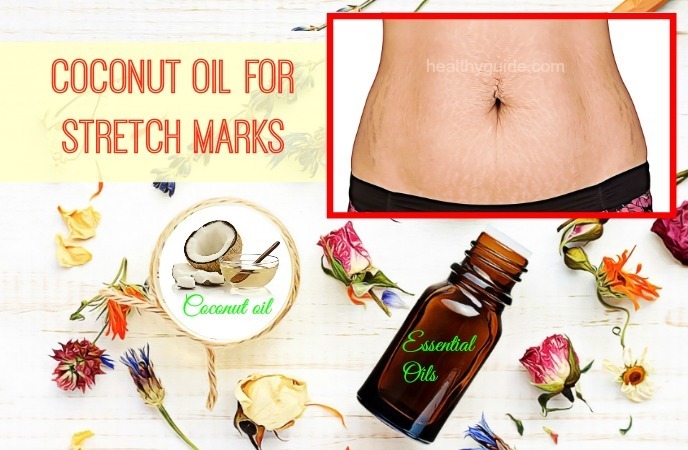 If you are looking for simple ways to use coconut oil for stretch marks during pregnancy, you can consider making use of this oil mixture. Firstly, mix coconut oil with camphor oil. Apply this oil mixture on your stretch marks. To know how to use coconut oil for stretch marks during pregnancy, you can try combining coconut oil with sugar and salt. Wash it off with clean water and pat it dry. Other great ways on how to use coconut oil for stretch marks on breasts must include homemade coconut oil cream. Firstly, extract gel from a fresh aloe vera leaf. Mix all of these ingredients well before pouring it into an air tight container. Now, apply it on your stretch marks. Repeat this home remedy twice daily. This is the last one among effective ways to use coconut oil or stretch marks on breasts that we want to mention in this article. Therefore, you should not look down it, yet try to apply it, especially if you are trying to eliminate your stretch marks by using natural ingredients. Mix evening primrose oil and coconut oil in a double boiler, and melt these oils over low heat. Stir it constantly, and sprinkle some water over the mixture. Mix constantly for several minutes before storing it in a container. Gently massage your breasts with a nourishing lotion or cream daily. Perform cardio workouts to increase blood flow to your breasts. Take a bath with lukewarm water in order to open the skin pores. Drink 3-4l of water daily to keep your skin hydrated. Remove dead skin cells regularly using exfoliating creams. Consume vitamin K-rich foods such as dairy products, tomatoes, liver, and green leafy vegetables. Perform a patch test before trying any regular treatments. Avoid scratching the stretch marks. Take omega-3 supplements in order to maintain the skin health. Be patient to see the results after applying home remedies. It may take you at least 1-2 months to show you a noticeable result. Coconut oil is considered as asafe and inexpensive remedy for stretch marks. So, after reading this interesting article, we hope that some of these 27 home remedies are helpful for you. If this article can resolve your skin problem or you know other effective ways to use coconut oil for stretch marks on breasts, do let us know by leaving your comments in the comment section below. To know further simple yet effective beauty tips, remember to visit our Beauty Category regularly.